Make your resume stand out—even if you don't have a lot of workplace experience. How do you get a job if you don’t have any job experience under your belt? Start with an internship—it’s a surefire way to develop the real-world skills needed to land a full-time job. In fact, the National Association of Colleges and Employers Job Outlook 2018 survey found that, while a strong skill set is important for new college grads to possess, employers prefer to hire candidates who have completed internships or cooperative education assignments. Aside from helping you get a job, internships can also be invaluable when it comes to helping you decide what you want to do (and what you do not want to do) in your career. There's only so much you can learn about a job, industry, or company from afar. Internships give you a front row seat before you actually join the proverbial production; you get to observe the inner workings of a company, how teams operate, how bosses lead, and how the work actually gets done. Moreover, you'll meet people who can teach you the necessary skills, as well as keep you in mind for jobs that open up in the future. To be a successful candidate for an internship, resume expert Kim Isaacs says it helps to have a resume that highlights your skills and accomplishments. 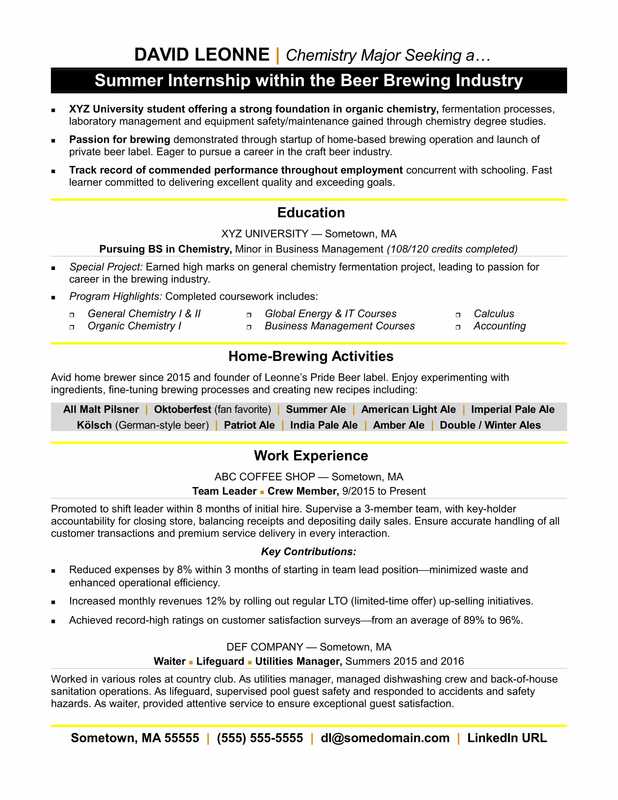 View the sample resume for an intern that Isaacs created below, or download the intern resume template in Word. Additionally, you can search for internships on Monster. XYZ University student offering a strong foundation in organic chemistry, fermentation processes, laboratory management and equipment safety/maintenance gained through chemistry degree studies. Passion for brewing demonstrated through startup of home-based brewing operation and launch of private beer label. Eager to pursue a career in the craft beer industry. Track record of commended performance throughout employment concurrent with schooling. Fast learner committed to delivering excellent quality and exceeding goals. Special Project: Earned high marks on general chemistry fermentation project, leading to passion for career in the brewing industry. Promoted to shift leader within 8 months of initial hire. Supervise a 3-member team, with key-holder accountability for closing store, balancing receipts and depositing daily sales. Ensure accurate handling of all customer transactions and premium service delivery in every interaction. Reduced expenses by 8% within 3 months of starting in team lead position; minimized waste and enhanced operational efficiency. Increased monthly revenues 12% by rolling out regular LTO (limited-time offer) up-selling initiatives. Achieved record-high ratings on customer satisfaction surveys¾from an average of 89% to 96%. Worked in various roles at country club. As utilities manager, managed dishwashing crew and back-of-house sanitation operations. As lifeguard, supervised pool guest safety and responded to accidents and safety hazards. As waiter, provided attentive service to ensure exceptional guest satisfaction. The competition for top internships is understandably fierce, which is why having a strong resume is crucial. You need to make sure it highlights your skills, experience, and interest, while also demonstrating how you'd bring value to the company or organization. Could you use some help smoothing out the details? Get a free resume evaluation today from the experts at Monster's Resume Writing Service. You'll get detailed feedback in two business days, including a review of your resume's appearance and content, and a prediction of a recruiter's first impression. An internship is an important first step on your career path, so be sure to put your best foot forward.